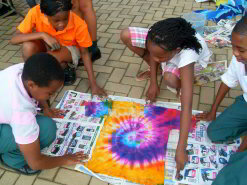 A simple idea that was born one afternoon in a textiles office led to a project that would see hundreds of disadvantaged children getting custom-designed t-shirts from ordinary South Africans. The T-shirts for Charity project is the brainchild of textile designer and tie-dye expert Melanie Brummer of SlipStream Dye and Prints, who started her career selling her creations at flea markets, and later ventured into the fashion arena. A year after its inception, the t-shirt initiative has been in operation for two months. Besides producing one-off handmade fabrics for top South African designers such as David Tlale, Marianne Fassler, Sun Goddess, and Nkhensani Manganyi of Stoned Cherrie, Brummer runs various workshops for corporate and private purposes. Here participants may be part of a team-building exercise, fashion designers looking for a fresh angle, or would-be entrepreneurs from disadvantaged communities wishing to develop new skills. 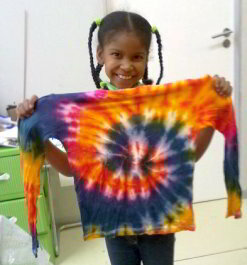 Her latest idea involves t-shirt painting classes where participants are asked to bring two plain white t-shirts with them. They then paint and colour the shirts with their own hands, using whatever colours they want in whichever pattern they want. They take one shirt for themselves – the other shirt is given to a child. This creates an opportunity for many citizens to play their part in making a difference to those less fortunate. Brummer described this new venture, where she works with NGOs to identify orphanages and distribute the t-shirts, as a big change from producing fabrics for high-end designers. Although she felt that people may be deterred by the concept of charity and not know where to begin to help, she was also sure that many genuinely want to contribute to a worthy cause. The original idea was known as 10 000 T-shirts for Charity. Here people brought a t-shirt to their class, enjoyed themselves decorating it, and were assured that it would reach a child who needed it. The difference with T-shirts for Charity, said Brummer, is that it also gives the giver something to take home – not just the garment, but also a lasting memory and feeling of accomplishment. Brummer said that the project gets South Africans to contribute to positive change and play their part in their country. Brand South Africa‘s new national initiative, Play Your Part, aims to get citizens to actively think about and begin doing something positive. All South Africans, including civil society, government, corporate and non-governmental organisations, are invited to take part, and use their available resources – whether that be time, money, skills or goods – to contribute to a better future for all.